Now that daylight savings time has started, reflective gear is more and more important for runners in the morning. It is the runner’s duty to stay lit up when running in the dark. Wearing all black, using a “cell phone flashlight,” or not being properly identified puts yourself in great danger. The single most important thing you can do for yourself and running is to stay safe. Paces, times, and goals are irrelevant if you are unsafe. Reflective gear has come so far in the last few years. You no longer “need” the traditional reflective vest. That’s not to say, it’s not great, but there are many different options to stay safe. This is a new product that isn’t invasive, heavy, or cumbersome. In fact, if you “hate” wearing additional layers, there is no excuse here! Safety skin is applied like body glide. It reflects against the light. It’s a great tool for those who don’t want extra layers or on a hot day when you want short sleeves but need to be reflective. Bonus points because it’s sweat resistant and it’s easily removable in the shower. For those who want a traditional vest, the Nathan Streak Reflective Vest is lightweight and breathable. It doesn’t inhibit you and allows full range of motion. Plus it’s reflective for over 1000 feet. The Neutron FireRX Runners Headlamp has 200 lumens of light. It has plenty of light to keep you safe and seen. It’s lightweight, so your head doesn’t get a workout carrying it. The beam is adjustable with five different settings. The light is rechargeable and lasts over 24 hours. One of the most low key and easiest ways to be seen, knuckle lights are designed to illuminate the pathway in front of you. As the name suggests they easily fit over your knuckles and have a strap to keep them in place. If you are looking for more the most reflective, and well-lit piece of gear, the Noxgear is it. The NoxGear uses a vest with light around the entire body. You look and appear like a running robot or spaceman. The light allows you to be visible from over a mile away plus there are all different colors to choose from so you and your training partners can be identified by your color choice. (Like Power Rangers). With different sizes, it fits every runner without bounce and chafe. Finally, depending on your favorite shoes, many brands now make a reflective version of the shoe. Asics, Nike, and New Balance are well known to make reflective versions, but other brands do too. Staying reflective doesn’t have to be complicated or intrusive. 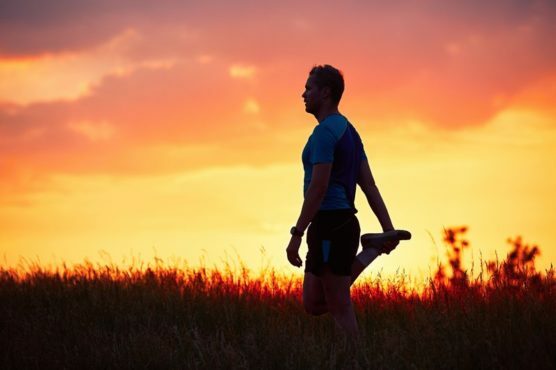 It’s the most important thing you can do for yourself while running. Questions for you: How do you stay safe on the run? Hollie Sick is an avid New Jersey-based runner who’s completed more than 40 half marathons and the 2018 New York City Marathon. Read her blog, or follow her on Facebook. Next post: How Important Are Our Race Route Maps to You?